Guess what happened today? Because I woke up early, I decided to work on reorganizing the pantry shelves. Our pantry contains both food items and bigger appliances (crockpots, mandoline, etc. – by the way, have no idea how to, and am kind of scared to, use the mandoline. If you listen to Kidd Kraddick, you’ll recall that he almost lost a part of a finger to one of those bad boys!). So….while being a cleaning busy bee, I saw an old sorority jewelry box that my Big Sis gave me in college. 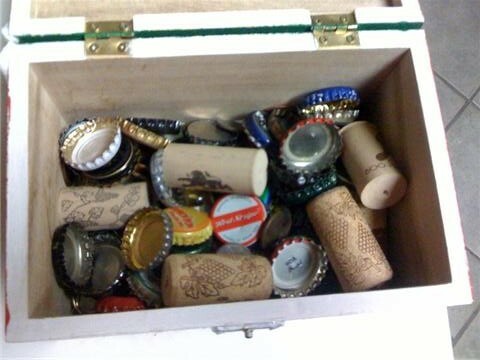 And, when I opened it, I found….our bottlecap collection. Ha. Okay, so, yes, I did find my husband’s somewhat-embarrassing collection of beer bottle caps. Even more embarrassing is the reason we no longer add to this collection (totally my fault), but I’ll save that for another day. But I digress. Under the fondly-collected bottlecaps, there were….THESE! 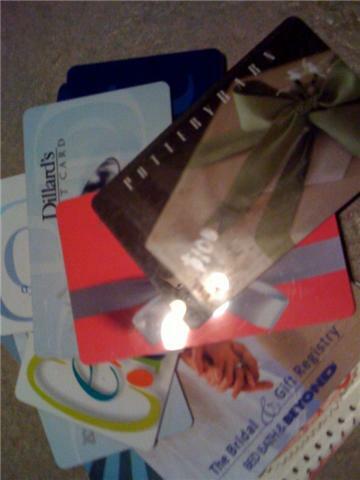 Gift cards from the wedding! In the back of my mind, I knew these were somewhere around, being saved for the rainy day otherwise known as buying a house. But, wow, it was so nice to rediscover this little hoard. These should make a big difference in our interior design budget. Woo hoo! So…I was extremely, knock-my-socks-off happy today. The moral of this story is that order may not breed chaos, but, if you’re naturally chaotic like me, it may breed some exciting results. And, if anyone feels like amusing themselves with guessing how much I found in gift cards today, I’d be happy to send the closest guesser a $5 Starbucks card (don’t think this is a real giveaway or contest; my blog is far too humble to host a giveaway and $5 isn’t much of a giveaway anyway. I just want to spread the good gift card karma with you lovely blog-world ladies! If you are looking for a real giveaway though, you should go visit Natalie at thebobbypin.com!). This entry was posted in Domesticity, Good News, Uncategorized and tagged generous friends, gift cards, hidden treasure, organizing, wedding. Bookmark the permalink. I will take a guess! $550. That is awesome!! We didn’t get too many gift cards, woe is me! I don’t do Starbucks so you don’t have to put me in your giveaway, but my guess, just for the fun of it, is $750.